1. What are the Bank Locations and Hours? 2. When is the Bank closed for holidays? 3. Where can I find loan information? 4. How does the Bank use my information? 5. What are the Bank's Fees? 6. I would like to bank online. How do I get access to eBanking? Below are the links from McHenry Savings Bank’s website home page. Click on the appropriate link to set-up eBanking. Detailed instructions are available in a pdf format for step-by-step instructions for each link below. In the right-hand corner under “Personal eBanking” click Enroll and follow the steps. To view or download the step-by-step instructions click here. Business customers must download and complete the Business eBanking Application for online access. In the right-hand corner, under “Business eBanking”, click Download Business eBanking Application and follow the steps. Once you submit your application, you will be contacted by MSB’s Deposit Services Team to set-up access to your accounts per your specific needs. To view or download the step-by-step instructions on setting up your accounts, click here. 7. What is “authentication code”? 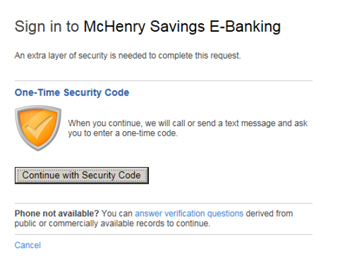 McHenry Savings Bank’s eBanking products offer increased security for online transactions through an advanced log in authentication. At your first login and any additional logins from an unrecognized device or IP address, the eBanking system will prompt you to request that an authentication code be sent to a phone number MSB has on file for you. You will receive a code via a phone call or via SMS (short message servicing) text for you to enter. If you want to use the MSB mobile app on more than one device, you will need to go through the “authentication” process for each device that has the app. 8. When can I start using the MSB Mobile Banking app? You must set-up your new eBanking accounts via website access BEFORE you can set-up and use the MSB Mobile Banking app. The MSB app features the Bank’s shield and is now available at Google Play and the Apple Store. Once you have logged into eBanking, you can then download the MSB app for mobile. The app will again take you through security authorization steps to complete your access. You can login with your eBanking USER ID and password once your security has been cleared. 9. I would like to make a deposit from my mobile device. What do I do? McHenry Savings Bank is proud to offer Mobile Check Deposit to qualifying customers. Customers must be enrolled in MSB Personal eBanking and have downloaded and set up the MSB Mobile app from the Apple App Store or Google Play. Click here for the Mobile Check Deposit guidelines. 10. What do I do if I don’t remember my password? You will be prompted to either have a security code sent to a phone (text or via voice) or you can complete the security questions. Once you verify your information, you can reset your password. 11. What do I do if I am locked out of eBanking? For the step-by-step instructions, click here. 12. What are some of the features of the Personal/Consumer eBanking product? To see a summary of features click here for Personal eBanking at a Glance. To learn more about all features with a step-by-step instruction to setting up your Personal/Consumer eBanking click here. 13. What are some of the features of the Business/Commercial eBanking product? To see a summary of features click here for Business eBanking at a Glance. To learn more about all features with a step-by-step instruction to setting up your Business/Commercial eBanking click here. 14. What is “Personal Finance Manager”? To help you understand, analyze and control all of your finances, MSB offers Personal Finance Manager. Personal Finance is an online service that helps you easily and securely view balance and transaction information for all of your accounts in one place. This includes account and financial information outside of MSB. To learn more about this financial tool click here to learn more about Personal Finance Manager. To sign up for this feature click on the Personal Finance Tab when you are logged into your MSB eBanking accounts. 15. I have a personal account but am having difficulty setting up eBanking. What can I do? Please call our Customer Service Representatives at 815-385-3000. They will be happy to help you through this process and will be able to answer any questions you may have. 16. How do I set up Bill Pay? 17. How do I add a payee? To add a new payee to your account, enter the name in the Pay someone new section and click Add. Then, follow the onscreen instructions. 18.How do I deactivate a payee? To deactivate a payee, from the list of people and businesses you pay, click the appropriate name and then click the View/change payee details link. From the Payee Details page, click Deactivate Payee. Just follow the onscreen instructions. 19. Why do people or businesses that are inactive still appear in my list? To properly store your billing history and ensure accurate reporting, we cannot completely delete payees from your account. However, you can "hide" payees that you no longer use by clicking on the Hide inactive payees link on the View My Payees page. 20. What happens if I have a dispute with a payee? f you have an issue with a specific charge on a bill, you will need to contact your payee directly. You can pay whatever amount you like while you are disputing a specific item or you can simply file the bill and pay nothing. 21. How do I change a payee nickname? Nicknames are given to your payees to help you identify your accounts quickly. To change a payee nickname, from the list of people and businesses you pay, click the appropriate name and then click the Change payee nickname link. 22. How do I know a payee is inactive? On the Make Payments page you can sort by all payees or active payees only. If the payee is inactive it will not appear in the active payees list. 23. How are payments issued? 24. When do I need to have funds available for a check payment to ensure it's processed properly? Since check payments may clear your account up to 4 business days before the deliver-by date, your account must adequately be funded at that time. 25. When do I need to have funds available for an electronic funds transfer to ensure it's processed properly? Since electronic payments may clear your account up to 2 business days before the deliver-by date, your account must adequately be funded at that time. 26. When will an authorized payment be debited from my account? While the exact time of the debit may vary due to when the payment is scheduled, please make sure that you have adequate funds in your account to cover those payments. This will ensure that your payment is processed properly and not subject to insufficient fund fees. Since check payments may clear your account up to 4 business days before the deliver-by date, your account must adequately funded at that time; for electronic fund transfers your account must be funded at least 2 business days before the deliver-by date. 27. What is a filed bill? A bill that you do not want to pay using this website, but want to save for your records. For example, a bill with a zero balance or a bill that no longer needs to be paid. Filed bills can be viewed in your bill history. 28. How do I cancel a payment? 29. How do I stop an auto-debit from my account? Or visit one of our Branch Offices. 30. Can I automatically file a bill without paying it? Yes, just click the "Don't pay this bill - I want this bill to be filed upon receipt" option on the Change Payment Options page and click "Save Payment Options." 31. Do you have access to my funding account? We only have access to your funding account in order to direct payments authorized by you. We will not access your funding account without your authorization. 32. Keep Your Debit Card More Secure with SecurLOCK! Learn more about getting this set up on your mobile device HERE.